How far would you go to get your teenager to drink raw milk? I love raw, full-fat milk but my daughter will have none of it. Teenager. Don’t ask! She likes milk on her cereal. I know, I know – ditto the above. Every time I go to buy milk for her I stand in the Whole Foods milk aisle totally flummoxed. Which is least bad of the organic brands? Does anybody know? And she doesn’t like the pasteurized but non-homogenized ones either. “I really like St Benoit, but you do have to shake it (just a little, it seems to blend really easily). It’s pasteurized but from Jersey cows fed on grass. Will she consider a super mild goat’s milk? Summerhill Dairy (at Trader Joe’s) is actually quite good and not ultra-pasteurized. Can you relate to this conundrum? What would you do? Some of us are known to hide liver in the meatballs or meatloaf we serve to our families, some may even sneak in a raw egg yolk into their smoothies … is that the same as buying the cheapest carton of organic pasteurized milk, pouring it out, filling the carton with raw milk and putting it back in the fridge? Is it worth risking the trust we have with our children if we do? 33 Responses to Would you deceive your child in order to nourish them? I would not be able to be so deceptive to my family members- we don’t lie to our kids or each other, period. That said, I would also draw the line wherever I considered necessary: I would not buy something special to please her when there is a better option already stocked in the fridge. If she wants her milk, she’ll drink the family’s milk. If she won’t, then she can go without (which would be an added bonus if the cereal went uneaten!). That said, I would teach her how to make almond milk or some reasonable alternative. I’m with Wendy, she can buy her own milk if she wants something other than what the family drinks. Or not eat cereal (yay). A body can survive without milk anyway. I would not refill her fave carton. I would have some serious talks about why her choices. If we cannot agree, I would let her buy her own milk. I’m not buying special milk for “teenage reasons”. Frankly, I hope to have a good enough relationship with my kids before they get to teens that this is not their MO. It is possible. I have seen it. i have teenage boys. they drink raw milk. because they “have to”. in our house it is raw or not at all. when they go to a friend’s i ask them not to drink even organic pasteurized milk. nor store make almond nor other milk, and really NOT soy milk when they are out. but they do what they do. when they are out. at home, if they don’t like the taste of the raw milk because it is later in the week i will make them warm chocolate milk. i would not suggest to them to buy their own. if they think of that i would say some things they can buy, and some things they will have to wait until they move out. my boys know that i am responsible to get their bodies growing well while they are in my house. once they move out they can eat things that will deplete their systems. they know that i am trying to get them to grow with 40% more bone mass than people on the s.a.d. (standard american diet.) and that i have to reverse the mistakes i made and my mother made and my grandmother made (think “potenger cats”). i take the raw milk issue head on with them, with love and compassion and certainty. and i hide liver, kidney and spleen (i think, i get it already mixed at the farmers market) in the hamburger. and i switch ketchup into non organic bottles. cuz it is a little thing. but i want them to know about the milk. i want their awareness to take in that they drink raw milk. so… with liver i will commit a lie of omission, with ketchup i will outright lie, but with milk we struggle and tussle and come to agreement at some point, even if begrudging agreement on their part. and i respect each families choices. i hold up some of what i am proud of, and my post would be even longer if i shared all of what i am not so very proud of. i tell others to do what they can, and forgive the rest. be at ease so you can allow peace to be the major feeling around food. Honesty and respect for a child’s choices and preferences are more nourishing to his body, mind and spirit than any food product or ideology. I tend to gravitate to that point of view myself. From the ideas suggested, I like the idea to have her buy her own milk. But I also know that teenage kids don’t always think rationally until they get older and make very poor choices. Yes kids need to make their own mistakes, but this is one of those things that you can probably get away with sneaking it. What’s better for her growing and changing body? That should be the most important question. Hasn’t anyone else grown up and realized your parent’s *were* right about a lot of things and weren’t you glad they kept at it and not given in to your poor teenage ideas? I surely can’t be the only one. Personally, I have mixed feelings about it. On the one hand, I think that even this kind of deceit is ultimately that – deceit and the risk to the sense of trust and connection in the relationship is significant. On the other hand, I can see myself justifying hiding liver in meatballs without saying a word, if it wasn’t noticed and there was no protest expressed. I also immediately thought about how many sneak liver into hamburgers, but it seems to me there is a big difference. With the hamburgers, there maybe a certain extent of dishonesty by omitting the fact that liver is one of the ingredients. But saying you’re having hamburgers is not a lie. In the case of the milk, this is an outright lie. My vote is with the “buy your own milk or don’t drink any” solution. I definitely relate to your mindset! I put liver in our chili, burgers, etc. but I don’t think of it as sneaky. If my kids ask I am truthful with them. If they don’t, well, I don’t feel compelled to describe for them all the other ingredients that went into the meal so why single it out? One concern I have about deceiving children is that they may come to believe their choices are not “all that bad.” If a child is raised on liver and raw milk without realizing it, then as they grow they may look at their good health and say “See, I didn’t need that stuff anyway!” Parents are then in the position of either coming clean to set the record straight or leaving their children with faulty assumptions that may affect their purchasing decisions. I am blessed to have found real food before my children were born. They are very small so it is all they know. I do my best to honor their cravings and internal wisdom about what their bodies need, but I also have no qualms about serving unpopular dishes that I believe are highly beneficial. If I get a complaint about liver, I consider it an opportunity to explain once again it’s immense value to the body. I think you make a sage point, Heather – about the benefit of educating our children about the value of the nutrient dense foods we serve to our families! I feel this way, too, Heather. This is a tough one for me! I have a 6 yo that LOATHES coconut oil. And I used to make granola bars with it and popcorn and she was fine…until she SAW ME using it for those things and suddenly she won’t eat those same things she used to like for fear there is coconut in it. I am worried about the teenage years! Maybe she’s getting it out of her system now. LOL HOWEVER she did eat eggs that were made in coconut oil this morning. I didn’t make them for her, she asked to taste mine and then said she wanted some so I shared. Had she asked I would have told her the truth. But she didn’t. Heehee. And I have used up a bottle of grapeseed oil and filled with coconut oil so she didn’t know what I was cooking with. I felt the benefits of it outweighed anything else. If she directly asks me, I won’t lie about it but she usually doesn’t. So I don’t know…maybe I’m a hypocrite? I’m really thinking hard on this now! I completely relate to your ambivalence! Especially in the case that she was enjoying the granola and popcorn as is with coconut oil, and now she won’t. I think it is definitely a worthwhile question to ponder, which is why I raised it for our community! I think age of the child makes a diffence in the circumstances as well. I would say no. Nothing is worth deceiving your kids, not even little white lies or leaving out the truth, and not even about food. I was tasked early on with helping Mom cook, so I knew what was in the food. Even if she made something I didn’t want, I had to try it. If I hated it I didn’t have to finish. I can now count on one hand the foods I don’t like, and I’m always excited to try something new. Children blossom when they are able to explore the world on their own timetable. Food is a deeply personal sensory experience, and bottom line, your relationship with them is more important than squeezing every last available nutrient into their mouths. As much as some of us care about nutrition, it is not a moral issue. Deception is. I personally think the answer here, as others have said, is to have the teenager buy her own milk. She should be allowed to choose what goes into her body, but there is no need for her mother to buy less healthy options for a picky daughter than she buys the rest of the family. It’s the mother’s job to provide healthful options. It’s the daughter’s job to choose what she eats. If she really wants that store-bought milk, she’ll buy it. If it’s not that important to her, then she may decide to save her money and drink what the rest of the family is having. I want to add that I think it’s fine to not list all the ingredients of a meal, just as Heather said. I mean, if someone has specifically requested to never be given a certain food, then of course you should tell them if it’s in there, but otherwise I don’t see need. However, if my child devours a dish with an ingredient he doesn’t normally like, then I will tell him it was in it. Just so he knows that sometimes it just depends on how the food was prepared. I took my teens to the Weston Price Conference this year. They eat well at home and they wanted to better understand things for when they are out with other teens and making choices about what to order, etc. But, my son especially, makes much better choices altogether as a result of attending the conference. So, for the original poster, perhaps she could buy the milk her daughter requests, or have her daughter buy it, but either way require her to watch Sally Fallon Morell’s DVD on Traditional Diets if she wants to eat anything other than what mom serves. We would suggest the Nourishing Our Children DVD, actually – much likely more palatable for children and teens! I am the one who posted the comment on the Yahoo group, but I meant it tongue-in-cheek. (You forgot to include my smiley face at the end.) Just want to set the record straight, that I would never deceive my kids that way. I guess the reason I responded that way to the poster was because she seemed to be asking for the impossible. There is no good pasteurized homogenized milk, even if it’s organic. You’re better off not drinking milk at all, than drinking it in a state where it contributes to mucus production, lactose intolerance and allergies. I suppose that would have been a more appropriate response, but at any rate, my comment seems to have sparked an important discussion. I’m working on a cookbook for kids right now and one of the points I make in it is that sneaking food into your kid’s diet is only a temporary solution, because as kids get older and become more independent we have less and less control over what they put in their mouths. As Alexandra says here, the answer is still “Teach. Teach. 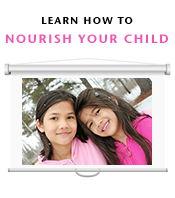 Teach.” When kids are given the right information, they can make their own healthy choices. I brought this up as a conversation topic at dinner tonight and would like to share my children’s responses. My 7 year old son suggests no playdates for a year for the teen who won’t drink raw milk. My 14 year old son thoughtfully suggests a reward or prize of some sort for the teen who drinks raw milk for three weeks exclusively–he presumes at the end of that time the teen will appreciate the taste and stick with it (as opposed to liver, the raw milk is definitely more delicious). My 16 year old daughter points out that deception is wrong but often mixing in the organ meats with other foods makes for yummier food which is always better. She also recommends telling the resistant teen that raw milk drinkers usually have a clear complexion and white teeth and other things that matter to most teens. I would not fill a carton with raw milk. I talk to my kids, they know what they eat. I find it very important to have a respectfull honest relationship with my kids. That said, I would not go out and buy something that I find below par, just to satisfy 1 child. I have 4 (of which 2 are teenagers). We discuss these things and I make very well clear why certain foods are better than others. I have not even gone down the road of hiding liver or so in meatballs. I have made mince and heart burgers, they know. They did not grow up on this food from the beginning, but they learned with me about better nutrition and with that are good with it. When they really do not like the taste of something (usually a particular vegetable) then that is fine. They do not have to eat it. I do expect everybody to at least taste something before saying they do not like it. My youngest 2 tend to think they do not like a certain food when they haven’t seen it in a while and with seasonal eating that comes around every year. So tasting is required, finishing is not. We still have the ketchup discussion though. One of my kids only likes shop bought and I make my own, so she rarely gets shop bought, only when we eat at a friends house. I wouldn’t switch the milk or let her buy her own. I am in charge of making the food decisions in my home and my children get to choose whether to eat or not but they have to taste everything at every meal. I also educate, educate educate! Our methods must be working because I have teens that WILL NOT EAT pasteurized dairy no matter where they go because they don’t want their faces to look like all their friend’s. ALL of my five children from 2-15 pretty much eat everything I offer and I didn’t start all of this until the last few years. In fact they are so adventurous that a couple of them ate raw chicken livers the last time we killed chickens. I don’t think I would ever be able to do that! This is how we deal with things in our home as well. I think it can be done lovingly and respectfully but still firmly. My husband and I work really hard to raise and grow most of the food we eat and we require a certain amount of respect for that hard work. We also educate our children (thankfully from the time they were tiny) and it makes a world of difference. I hide liver in meatballs because they ask me to. They know it’s good for them but don’t love the taste so they brainstorm ways to get it in their diet. I have four kids and one doesn’t like brusselsprouts :) I figure I can live with that. Any of us who have ever grated zucchini into the muffins in secret can tell you it doesn’t destroy trust. My oldest grandchild is almost 21 and his mom and I get along wonderfully in spite of the zucchini and pulverizing other veggies in the vita cost and adding them to soups. Its a constant source of humor between me and my daughter. She loves telling the story of how she and her sister used to spirit the vitamins out the back door and throw them into the canyon when they thought I wasn’t looking. I didn’t care because I knew that most of the time they took the vitamins. I realize this was written a while ago, but I just came across it. I can understand that maybe as a teenager, this girl is trying to separate herself and her priorities from her mom in some way, but I would think that intentionally deceiving her wouldn’t be the way to go. She should either have her daughter buy her own milk with her own money if she won’t eat what everyone else is eating, but even better than that maybe they should be having conversations about WHY her daughter won’t eat the way she has been brought up on? It sounds like they’re not having conversations about food in a healthy way which is just as bad as feeding our kids junk food. If we don’t teach them why we eat the way we do and as they get older allow them to make their own decisions as they get older in regards to their own nutrition we lose something there. Better to be honest, have the conversations, and if the daughter insists on having only pasteurized, homogenized milk she needs to buy it herself. Changing your food choices simply because you think a parent is “weird” for what they’ve chosen isn’t a good reason to go off the deep end with crappy food, but neither is it justification for the parent not to have the discussions, be honest, and allow the almost-adult to make her own food choices for good or for bad. How pure are “organic” self care products?